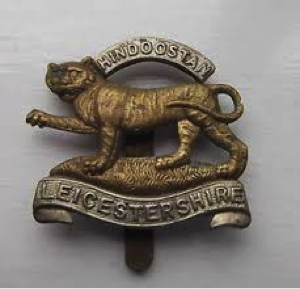 The Royal Leicestershire Regiment was raised on the 27th September 1688 and was known as the 17th Regiment of Foot. In 1804 the Regiment embarked for India and served there for over eighteen years. Here they saw challenging times in some of the most remote parts of the country. In 1807 they fought in Bundelkund, in 1808 on the Sutlej and against the ferocious Gurkhas in Nepal during 1813-1814. Ironically, one hundred years later, the Leicesters were fighting with the Gurkhas. The Regiment left India in 1823 and as the service of all its ranks was considered so valuable and abounding in courage and endurance, it was granted that they could carry the Green Tiger and the word ‘Hindoostan’ on their colours. In 1825 the Regiment was awarded the Honour of wearing the insignia of the Royal Tiger superimposed with the word Hindoostan, in recognition of its exemplary service and conduct during its campaigning and long tour in India from 1804-1823. Since that time the Regiment has always proudly been called "The Tigers". At the Battle of Neuve Chapelle in March 1915 the Garhwal Brigade’s Indian battalions were held up by uncut wire, but the 2nd Battalion Leicestershire Regiment were able to attack and quickly overwhelmed the enemy and held the trenches. There were many ‘gallant deeds’ reported that day by the “Tigers”, the most notable being that of Private William Buckingham who was awarded the Victoria Cross. On the 25th September 1915 the Battle of Loos began and another Victoria Cross was awarded, this time to a Gurkha soldier, Kulbir Thapa. Kulbir Thapa was born on the 15th December 1889 in Palpa, Nepal. When the Battle of Loos began on the 25th September 1915 he was 26 and serving as a Rifleman with the 2nd Battalion of the 3rd Queen Alexandra’s Own Gurkha Rifles. The Allied Infantry assault began at 6.00 a.m. and under the cover of thick smoke Kulbir Thapa was in one of the leading companies who tried to break through the German wire at Fauquissart. Kulbir was wounded and became stranded on the German side when he came across a wounded soldier of the 2nd Battalion, Leicestershire Regiment behind the first-line German trench. The ‘Tiger’ was Bill Keightley from Melton Mowbray, and despite his injuries Kulbir Thapa stayed with him all day and all night. A mist had formed the following morning and Kulbir was able to drag Bill Keightley through the German wire and take him to a place of relative safety. He then went back and in broad daylight, fetched two wounded Gurkha soldiers and took them, too, to safety. 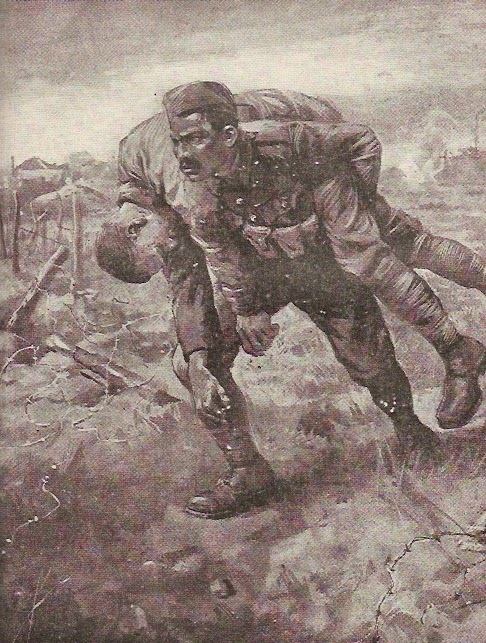 His courageous act attracted a great deal of attention and it is reputed that when he brought yet another wounded soldier to safety, carrying him over his shoulder, that the Germans applauded him. Percy Pollard may well have been speaking of Kulbir Thapa, when they were both at Loos in September 1915. Rifleman Thapa was indeed awarded the Victoria Cross for the Battle of Loos and was gazetted on the 18th November 1915. Darwan Negi of the 39th Garwhal Rifles was also awarded a VC for his brave action 23-24 November 1914 at Festubert, France.